Hydra-Tech wrapped up another great WWETT Show on Saturday afternoon before packing up and returning home on Sunday – thanks to all of our customer and friends who made it to the show and stopped by to visit! For those of you wondering what the WWETT Show is – WWETT stands for Water & Wastewater Equipment, Treatment & Transport. The show was original called the Pumper Show from its inception until about 5 years ago when they made the name change. Originally the Pumper Show was primarily focused on septic tank pumping professionals but the show has evolved through the years to include so many more applications and professions that it was renamed. 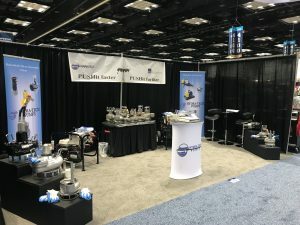 Hydra-Tech was one of 624 exhibitors showing their hydraulically driven submersible pumps and power units in the Indianapolis Convention Center for the two and a half day show that drew more than 12,000 visitors. At the show we saw some customers we expected to see, as well as some surprises and new prospects as well. We helped some visitors decide if our pumps would benefit them, and if so, how best to power them and maximize the benefit of hydraulic submersible dewatering pumps. We saw our old friend James Penner from In The Round Dewatering (see our blog post last year about working with James https://hydra-tech.com/one-thing-leads-another/. While it did rain most of the time that we were in town, we managed to enjoy some of Indianapolis’ great restaurants and bars after the show. We have been to our fair share of trade shows in the last 11 years in a number of different cities. 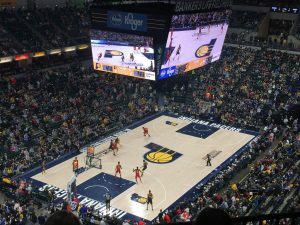 And while Indianapolis doesn’t offer the over the top kind of excitement of the Las Vegas Strip, we have always enjoyed Indy because everything is right downtown within walking distance from the hotel and convention center. As well, like Minneapolis / St. Paul, there are a number of connectors downtown that allow you to move from block to block and cross streets without getting wet in the rain. We will be back next year for WWETT Show 2019 – will we see you there?